Bahrain 1 Fils 1965 AH 1385 Rare! 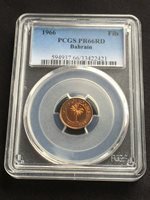 Bahrain 25 Fils 1965 AH1385. KM#4. Twenty five cents coin. Palm tree. Bahrain Complete set 1+5+10+25+50+100 Fils and Banknote - 100 1965 AH 1385 Rare!